James Bollmeier of Advanced Veterinary Center spoke to the Planning Commission about his proposed veterinary clinic on East Highway 50. O’FALLON –At a planning commission meeting on Tuesday, March 12, the commission oversaw an application from James Bollmeier of Advanced Veterinary Center requesting a planned use approval to operate a veterinary clinic and boarding operation in existing buildings off Highway 50. The buildings, which are located at 706 and 800 E. Highway 50, is a 3.5 acre site located across from the O’Fallon Township High School football field and has approximately 21,000 square feet of total office space. The site was previously occupied by Memorial Healthcare but has been vacant since January of 2018. Bollmeier requested of the planning commission that the property be rezoned from “B-1” Community Business District to “B-1P” Planned Community Business District. The proposed development would utilize the existing buildings to provide veterinary services — including exams, imaging, routine surgeries and overnight boarding. No changes will be made to the interior floor plan. The property surrounding the proposed Advanced Veterinary Center is a mixture of non-residential and residential uses, including a school, apartments, retail, and single-family residences. 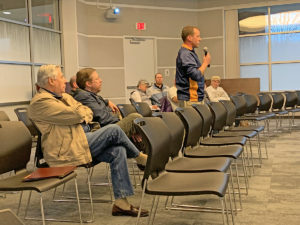 At the March 12 meeting, residents of Holliday Drive in O’Fallon voiced their concerns about the proposed business and its proximity to their homes. Holliday Drive is a residential street behind the business. Patty Sergott of 909 Holliday Drive said she was concerned over the noise of dogs within the two buildings. Kelly Steadman, an engineer from Woolpert, Inc., said at the meeting that a sound study was conducted for the buildings. Steadman said they recorded the noisiest sound from Bollmeier’s existing Four Paws building at 2006 West Highway 50. 1. The dedicated dog-walking areas must be fenced with a 6-foot vinyl fence. Ordinances, including the removal of the sign on 706 E Highway 50. 4. The parking lot must be restriped, and accessible parking signs brought into compliance with Illinois Accessibility Code requirements. The commission removed the recommendation that a six-foot vinyl fence must be provided along the rear of the parking lot. The commission also approved a recommendation that Bollmeier have another sound study completed in the evening and at 800 E. Highway 50. The sound study conducted previously was only at one of the two buildings, 706 E. Highway 50.